We all have our problems, I guess. 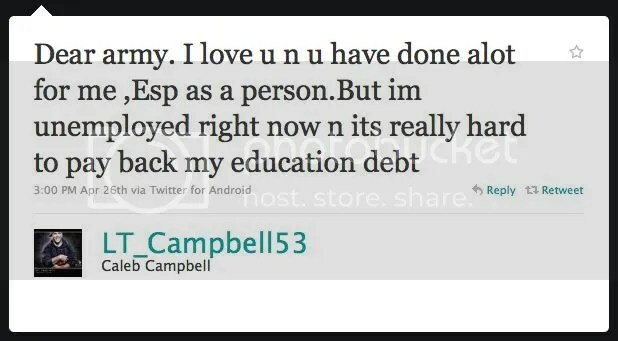 For Mr. Campbell’s sake, I hope his West Point degree is worth more in his employment search than an Air Force Academy degree is. It’ll take a while to pay back the government if your only prospects are plumbing and chicken wings. In other news, there was a time when a headline like this would seem a little ridiculous when talking about a soon-to-be service academy graduate. I guess not anymore. This is just pathetic. What a crybaby. His NFL riches aren’t pouring in and now he is whining about having to pay the Govt. back for his education. What a selfish #$%^! Somehow it seems that Campbell’s early out from the Army diverged from the SECDEF’s 2 yrs active duty / 6 years reserves policy, if he’s having to pay back his education. Prorated to account for his service as a bobsledder I’m sure. I kind of felt bad for Campbell the way the whole thing went down with him. He was just taking advantage of a (crappy) program that was in place. However, he would be best served at this point by just keeping quiet and laying low. Blast away. There was implied disapproval of his comments when I said he should just keep quiet, i.e. quit bitching. I just took a short glance through his archive of “tweets.” Do they teach English at West Point or is that considered an elective? I wouldn’t hold someone’s Twitter grammar against them.